American Airlines has some quirky routing rules restrictions when you book award tickets with miles. However, one of the weirdest rules has been that you can only connect in Doha when connecting in the Middle East. This meant you couldn’t connect on Etihad Airways out of Abu Dhabi or Royal Jordanian out of Amman. However, as JonNYC reported yesterday, American has removed this restriction which opens up a bunch of opportunities for those with American miles. Now, don’t get me wrong, American Airlines still has plenty of quirky routing rules but it’s great to see this change. Make sure you check out our guide to redeeming American miles for a complete rundown on the routing rules, how to book and more. Let’s take a look at what these changes mean for you. *The origin and destination can be swapped. What does this mean, practically speaking? Well, let’s say you want to fly to South Africa. Before this change, if you wanted to fly the Etihad Apartments from the US to South Africa, you’d need to book two separate awards. 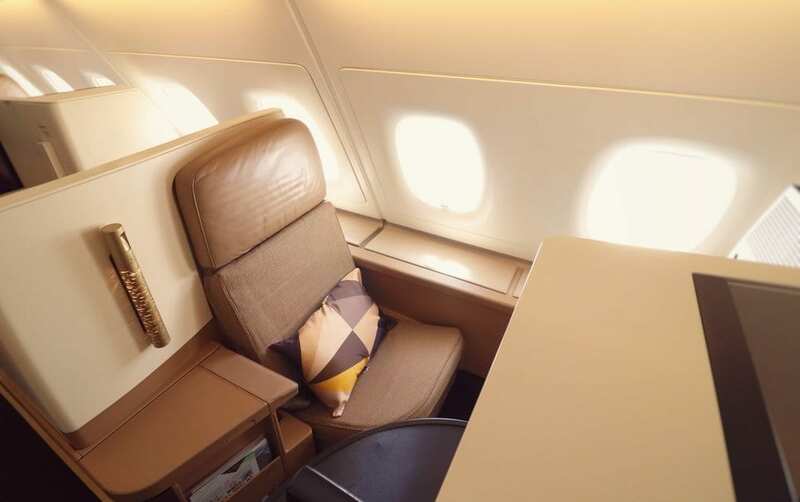 Technically, you’d need to book a first class award ticket and a business class award ticket as Etihad does not operate a flight with first class to South Africa. So, you’d need to use 115,500 American miles to fly from New York (JFK) to Abu Dhabi in the Apartments. Then, you’d need to book a business class award from Abu Dhabi to Johannesburg for 40,000 more miles. That’s a total of 170,500 American miles. Now that you can transit Abu Dhabi, you can drop that price to 120,000 miles — a savings of 50,500 miles! Now, you still need to call to book American’s call center in Australia or New Zealand to book business and first class award tickets on Etihad — seriously, read our guide to booking with American miles — but you’ll save a ton of miles. Now, if you want to book a flight on Royal Jordanian to Asia or Africa, you can easily take care of that with a search on American’s site. As you can see in the example above, a simple search from New York to Tunis provided a one-way business class option for 75,000 American miles. Previously, this would have required two separate awards with a total cost of 125,000 American AAdvantage miles. It can’t all be positive news, I guess. You can no longer book an award ticket from the US to India with connections in both Europe and the Middle East. While this is disappointing, you can now connect on either Etihad or Qatar Airways so, hopefully, that will make up for this change. When you consider the fact that award space on Qatar Airways has been quite sparse recently, this is a welcome development. While the restriction was a bit silly in the first place, we’re glad to see American make it easier for customers to use their miles for some aspirational travel. Personally, I think it would be a ton of fun to book the Etihad first class from Sydney to Paris or London for 115,000 American miles as part of an around the world adventure. Hopefully, you’ll be able to use these changes to your advantage soon! Still too restrictive. If they opened up the ability to fly to Asia with a connection in Europe or Middle East, similar to almost every other carrier’s frequent flyer program, that would be welcomed news. I completely agree that they need to make that change. I’ll still take small wins as I can get them. Would love for them to follow this up with a change to routing rules to Asia. Also, I really think AA should allow connection in Asia when traveling to Australia/NZ. Funny. I actually bought a ticket using AA miles in July 2017. It was one way ANU-JFK-AUH-IXE. The ANU-JFK leg was on American, JFK-AUH was on Etihad, and AUH-IXE was on Jet Airways. Were the restrictions imposed after that? I’d be curious to see if you could still do this. As far as I know, the restriction added specifically relates to having connections in Europe AND the Middle East. If that’s the case, your routing should still work. I’ll have to dig into it. Does this mean that an LHR–AUH–SYD routing in EY F is now only 115,000 AA miles straight through (as opposed to 162,500 [62,500 + 100,000])? Doubtless, wishful thinking on my part, but love to be proved wrong! Hey Simon – Not wishful thinking at all. That would fit the routing rules so you could book it at 115k AA miles. on negative change, sorry I couldn’t completely understand. ORD-AUH-MAA or ORD-DOH-MAA was possible even before this change, so what is different now after new routing rules exception that was introduced? if you could explain that ll be helpful as I am planning to book this route but couldn’t find any award space on either of the carriers lately. Hey Naga – Previously, the route you mentioned was bookable via AUH or DOH previously. However, there were a number of routes that allowed connections at DOH but not AUH. American updated its routing rules so now you can connect at AUH on these routes. For your trips to MAA, this change won’t impact you. Thank you. Just one more clarification, now it is not possible using AA miles for the route ORD-CDG-DOH-MAA and ORD-CDG-AUH-MAA … correct? That’s correct. You won’t be able to connect in both Europe and the Middle East. You’ll have to pick one region for the connection.